Family-owned and operated for over 40-years, we are your one-stop shopping destination for all your Yard, Garden, & Pet care needs. 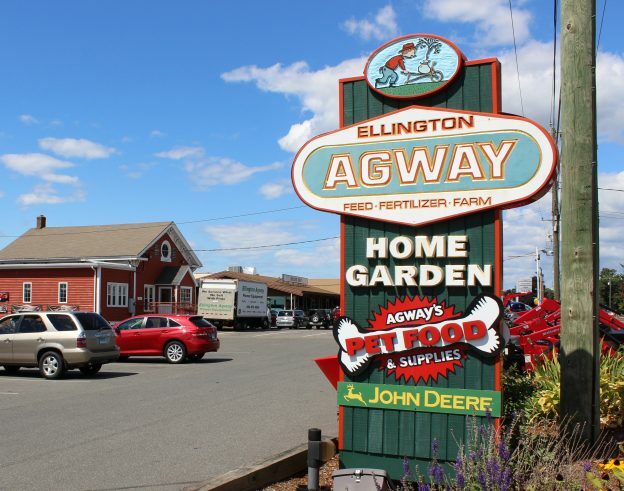 We are a Garden Center, Wild Bird, Pet, and Farm Supplies store, and Power Equipment dealer all under one roof! Our showroom boasts an incredible variety of product lines – selectively chosen to meet the needs of our local customers. Our friendly, knowledgeable staff is comprised of devoted family members, enthusiastic new-comers, and long-time employees – Here to listen, offer advice, and assist you in finding the perfect product to meet your needs. We are devoted to bringing the community top-quality merchandise, service, and convenience at competitive prices while never sacrificing the “old country store” feel. Call or stop in today! In 1928 Werner Kupferschmid went to work for the Ellington Vernon Farmers Exchange unloading 100-pound bags of grain. His hard work and determination led to a promotion, and in 1936, the young Kupferschmid became manager. He and his wife, Clara, who took care of the bookkeeping and customer service, operated the business from their home and two-bay garage until 1950 – at which time the business was moved to a rail siding on Spring Street in Rockville. In 1968 the business moved to its present location on Route 83 in Ellington. As the nature of the region changed from agricultural to residential, the board of directors of the Ellington Vernon Farmers Exchange voted to liquidate the cooperative, and in 1972 the business was sold to the three sons of Werner Kupferschmid; Gene, Stuart and Wayne. Today, Agway is in its third generation of ownership. Cory and Grant Kupferschmid currently run the business with the guidance of their father, Wayne. The showroom boasts an incredible variety of Home and Garden needs. Product lines now include pet food and supplies, bagged feed, wild bird and lawn and garden supplies… just to name a few. Our friendly, knowledgeable sales staff is comprised of devoted family members, enthusiastic new-comers, and long-time employees – all here to assist you with your selections and to help load purchases in your car. As we move into the future, it is the goal of Ellington Agway to continue to as the Kupferschmids have for years.